The celebrated W. A. Nesfield had three successive careers in his long life, as a soldier, painter and garden designer. He was successful in each, finally settling on the last as a way of using his considerable skills and experience to establish a prolific business supplying appropriate gardens for gentlemen’s revivalist country seats. Indeed, so successful was he in this last venture that, in the mid 19th century, he was the dominant private garden designer in Britain, with more than 200 completed commissions to his name and a train of imitators such as Ninian Niven in Ireland. Nesfield’s style, rooted in the Picturesque ideals of his youth, typically created terraced parterres based on 17th-century French originals, laid out in meticulous scrolls and arabesques of box against a ground of coloured gravels, with statues and topiary providing vertical accents. A key factor in Nesfield’s rise was his close relationship with his brother-in-law, the architect Anthony Salvin, whose Jacobethan piles were designed to overlook just such symmetrical mosaics. Nesfield’s polite background provided him with an entrée to society, so that his clients included members of the aristocracy and a wide range of landowners with both old and new money. His career peaked in the mid 19th century with patronage from Prince Albert. As the roll call of his private projects gathered pace-Holkham in 1849, Castle Howard in 1850 and the unwieldy ‘monster project’ of Witley Court in 1858-Nesfield’s name began to appear in connection with major institutions of the day, although he always held himself aloof from the public-park movement. The layout around the Palm House at Kew of the terrace, lake and broad avenues through the arboretum is his, and Nesfield was chosen to design the RHS’s new garden at Kensington, opened by Prince Albert in 1861. This was Nesfield’s moment of national glory, but it was short-lived: this was Albert’s last public engagement before his death, and the society soon found itself unable to fund the garden adequately. As it declined, Nesfield’s style gradually fell from favour. His last great project was Avenue Gardens in Regent’s Park, designed jointly with his son Markham in 1863 and now gorgeously restored. Despite Nesfield’s painterly approach, however, in the later part of his career, his work was criticised by the rising generation of plantsmen led by William Robinson, who dismissed his precisely controlled style and execution as too inflexibly architectural. Nesfield’s reputation is only recently resurgent, so that he is once more acknowledged as the leading British garden designer from 1840 into the 1860s. 1794 William Andrews Nesfield was born the son of a clergyman in Chester-le-Street, Co Durham. He was intended for the Church, but opted for the army, serving at the tail end of the Peninsular War in Spain in 1812, and later in Canada. During his military career, he was taught landscape painting by Thomas Paul Sandby, and also studied engineering. 1818 Reduced to half-pay in 1818, he embarked on a career as a landscape watercolourist in the golden age of that style, and found his work admired not only by peers such as David Cox, but also by the critic John Ruskin, who considered him second only to Turner in his mastery of waterfalls. Nesfield might have continued in this vein, but a growing family brought a pressing need for more income. 1830s During the 1830s, he increasingly turned his hand to the more lucrative business of garden design. Nesfield’s ‘artistical’ style (his word) was rooted in his understanding of the Picturesque principles promoted by Uvedale Price, whom he called ‘my master’, at the beginning of the 19th century. By 1840, the Picturesque had evolved into a heavy-handed antiquarianism, which launched many architects on careers building country houses in ‘period’ styles for a generation of land-owners brought up on the novels of Sir Walter Scott. One of these architects was Anthony Salvin, Nesfield’s brother-in-law. Nesfield and Salvin had shared offices as early as 1826, and the two families continued to live in each other’s pockets for many years. beries to the garden front, where a delicate parterre lay on a shallow terrace under the windows. Loudon enthused that Nesfield had ‘lately directed his attention to landscape gardening, and that with so much success, that his opinion is now sought for by gentlemen of taste in every part of the country’. 1840s-1860s Nesfield led the field of country-house garden designers from 1840 until the mid 1860s. 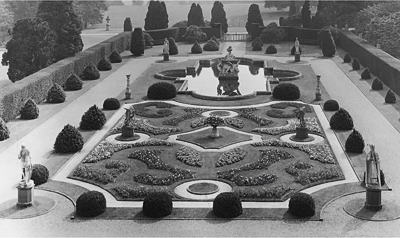 An early triumph was the garden for the Marquess of Westminster’s Cheshire seat, Eaton Hall, for which, in 1843, Nesfield designed a precisely terraced double parterre on a ground of white gravel, featuring his characteristic graceful arabesques of box, on this occasion woven into a heraldic-looking ‘W’.